Salmon River whitewater rafters along the Salmon River Scenic Byway. 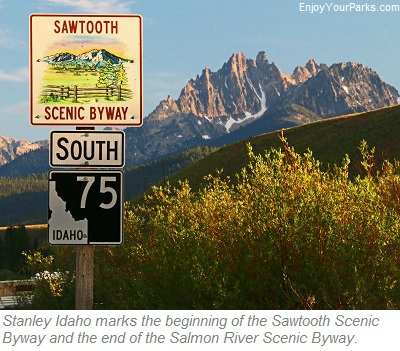 proceeds to follow it all the way to Stanley, Idaho, which marks the end of the Salmon River Scenic Byway. 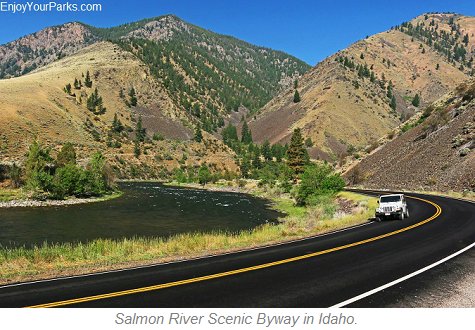 This 162 mile long Idaho scenic byway is one of our favorite byways because of not only the incredible beauty but also the amazing white water rafting adventures and fly fishing adventures that are also found along the way. 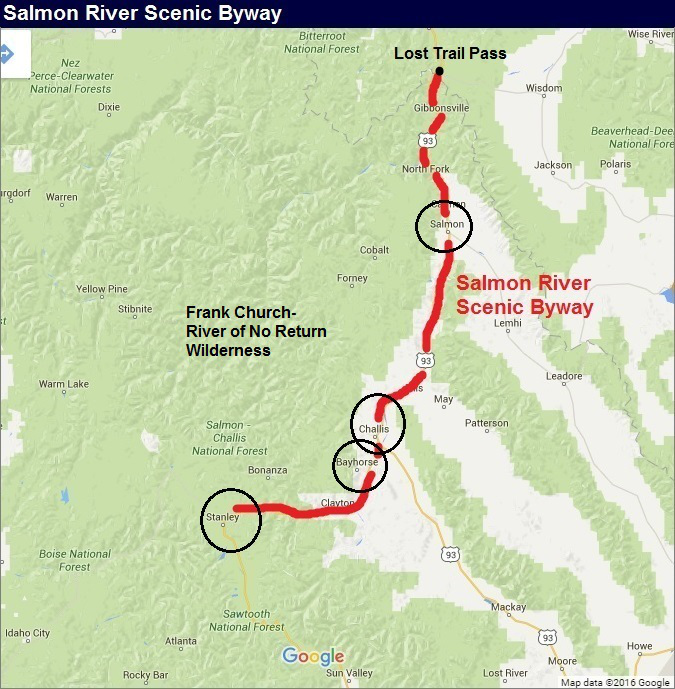 The highway you will be traveling on along the Salmon River Scenic Byway is U.S. Highway 93 between Lost Trail Pass and the town of Challis, where you will then continue onward to Stanley on Idaho State Highway 75. Not only will you see incredible scenery as you follow the Salmon River (a.k.a. 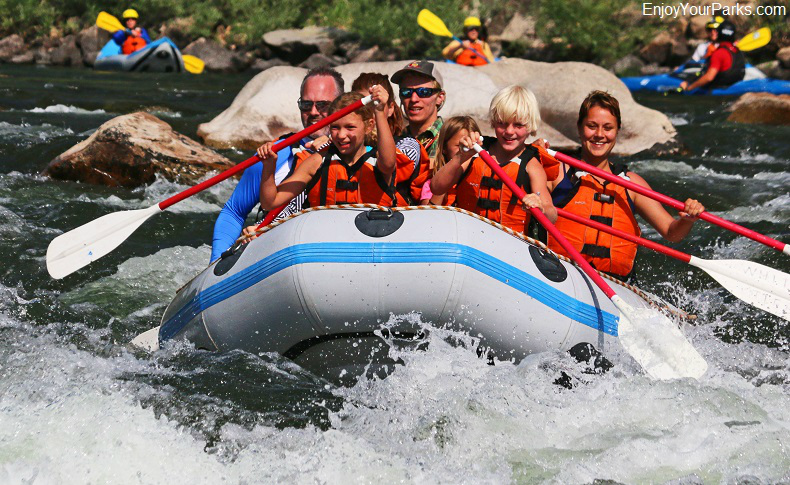 River of No Return), which is one of the most gorgeous rivers in the West, but you will also have a great time exploring and discovering the wonderful tourist town of Salmon Idaho, as well as the smaller yet charming tourist towns of Challis, Clayton and Stanley. The fly fishing opportunities are remarkable, and deep into the forested canyon between Clayton and Stanley offers some outstanding white water rafting and kayaking opportunities. Once you get close to Stanley, Idaho, you will get a fantastic glimpse of the incredible Sawtooth Mountains, which will indeed beckon you to explore. The Salmon River with the Sawtooth Mountain Range towering above the town of Stanley, Idaho. Salmon River with the Bitterroot Mountain Range along the Salmon River Scenic Byway in Idaho. similar to when Lewis and Clark crossed this divide only abou 1.3 miles northwest of Lost Trail Pass on September 4, 1805 on their way into the Bitterroot Valley in Montana. Lewis and Clark then stayed at Traveler's Rest near Lolo Montana, and then passed over the Bitterroot Mountains once again, but this time at Lolo Pass, then entered present day Idaho following the historic Lolo Trail. 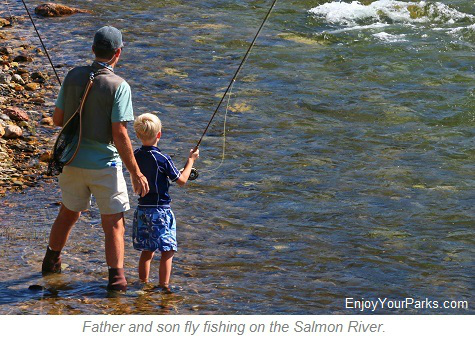 The Salmon River of Idaho is also known as "The River of No Return", and is famous for a multitude of things- one being a fly fishing mecca... especially near the town of Salmon Idaho. 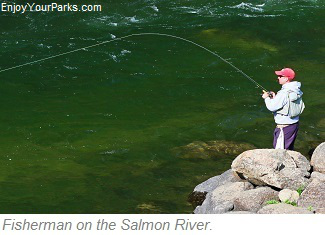 Fishermen and fisherwomen from around the world come to this area to test their skill on the fabled water of the Salmon River waters for its legendary trout. Along this stretch of the river you will see plenty of drift boats floating down the river with folks casting their flies. 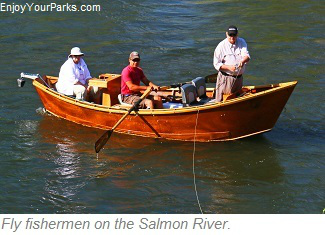 Fly fishermen using a drift boat on the fabled Salmon River. Nestled below the Bitterroot Mountain Range and resting along the banks of the Salmon River (a.k.a. 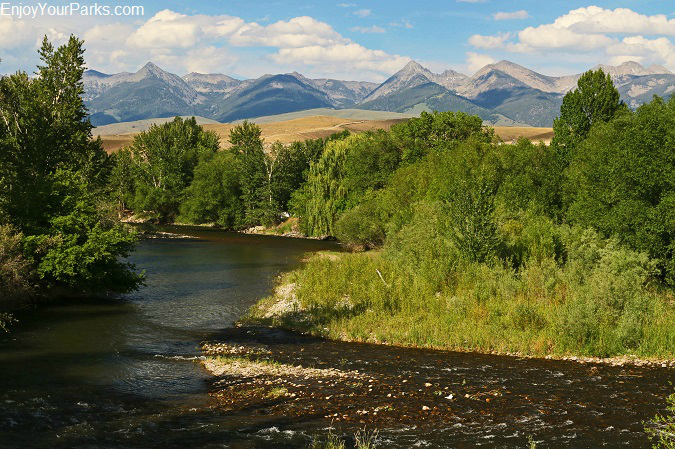 River of No Return), Salmon Idaho is an absolutely fantastic tourist town and outdoor adventurers headquarters which you will drive through along your journey on the Salmon River Scenic Byway. There are terrific shops, restaurants and lodging, as well as outstanding guide services that will take you on some of the best fly fishing adventures you've ever experienced. 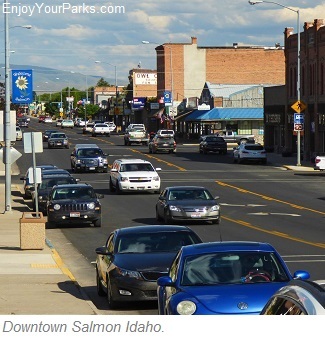 The town of Salmon Idaho has a population of only about 3,000 residents, and they've created a wonderful environment for visitors. 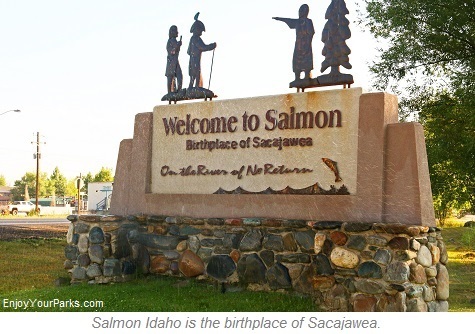 We always enjoy spending time in Salmon Idaho every time we're in the area, and we are confident you will too. 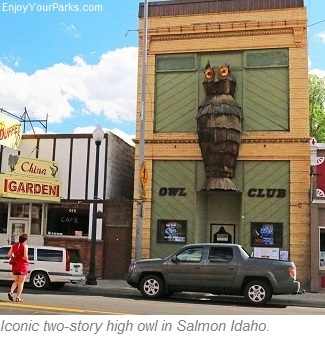 Oh, and don't forget to take a photo of the two story high owl located on main street...It's an Idaho icon! Salmon Idaho along the Salmon River Scenic Byway. Salmon Idaho with the Bitterroot Mountain Range in the background. success during their historic expedition in the early 1800s. 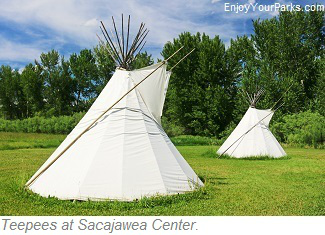 The Sacajawea Center also holds indoor and outdoor concerts in the summer, as well as annual historical events, festivals, family historical programs, kids summer camps and dutch oven cookouts. 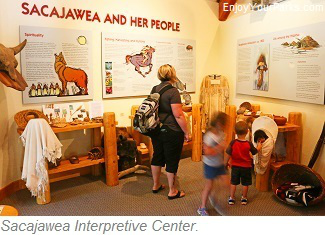 Located at the Sacajawea Center Research Library, visitors can view or purchase Expedition Journals, field guides, Native American topics and children's books. 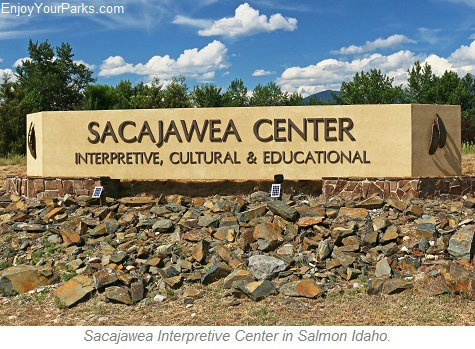 Salmon Idaho is the birthplace of Sacajawea, and is where you'll find the Sacajawea Interpretive Center. million acres of what is known as "Custer Country". Challis is located near vast public lands containing the White Cloud Mountains and the Frank Church River of No Return Wilderness. This area provides fantastic fishing, hiking, mountain biking, mountaineering, skiing, hunting, river rafting and off-road trail riding. 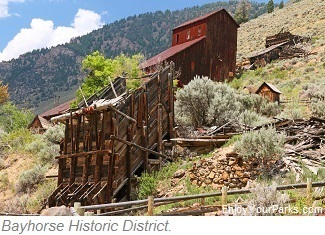 For the historic buffs in the group, Challis was the headquarters for one of the most famous mining districts in Idaho, and the North Custer Museum does an oustanding job sharing with its visitors the fascinating history of this historic area. The Land of the Yankee Fork State Park is located along the Salmon River Scenic Byway near Challis Idaho, and provides visitors with fascinating information on one of the most famous mining areas in Idaho, which is known as the Land of the Yankee Fork Historic Mining District. The state park interpretive signs and a visitor center featuring the Land of the Yankee Fork Mining District, the ghost towns of Custer, Bayhorse and Custer, and the monstrous gold dredge found on Yankee Fork. 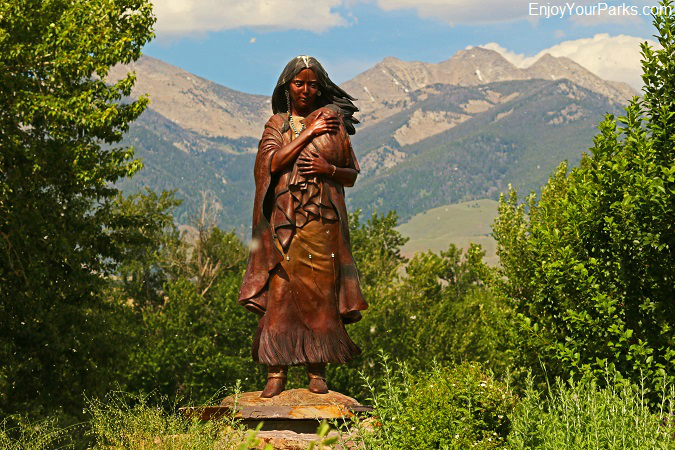 A trail was used during the old mining days that took supplies from Challis to the Yankee Fork Mining District, and you can follow this historic trail by driving the Scenic Custer Motorway. early 1890s, the town of Bayhorse had many cabins, boarding houses, assay offices, banks, saloons, six beehive kilns and two cemeteries. The town reached a population high of about 300 residents. Then as boom towns alway do, they then bust. 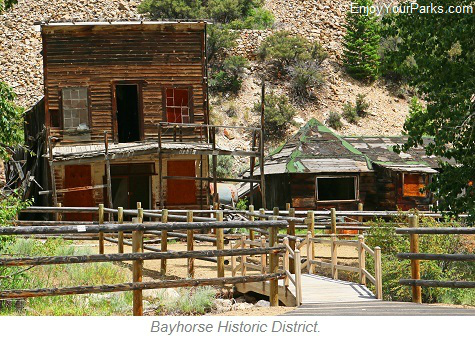 By 1915 all was abandoned, and the booming town of Bayhorse became a ghost town. Periodically, some mining operations would crop up in the area, but the last was closed in 1968. 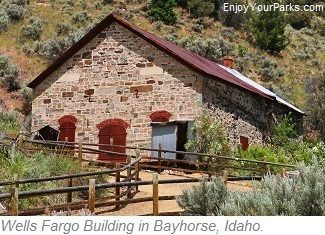 But through the years, the Bayhorse Mining District was among the longest running lead and silver producers in the state of Idaho, and in 1976 Bayhorse was placed onto the National Register of Historic Places. Then in 2009, the Bayhorse townsite became part of the Land of Yankee Fork State Park, where visitors were allowed inside the ghost town for the first time. There are several structures still standing, including the Bayhorse Saloon, numerous cabins, a mill, the beehive kilns and the stone Wells Fargo building. Bayhorse is located approximately 14 miles southwest of Challis in the Salmon-Challis National Forest. 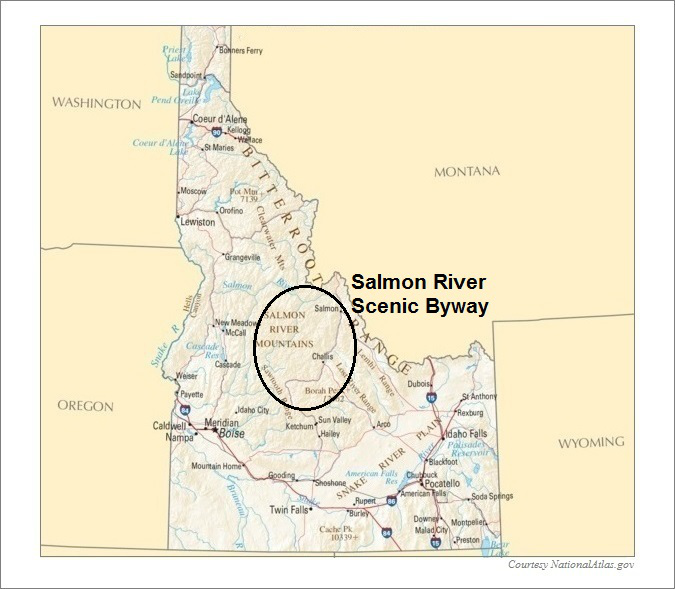 Once you leave U.S. 93 and begin your drive on Idaho State Road 75 along the Salmon River Scenic Byway, turn right onto a narrow road known as "Bayhorse Creek Road" for about 3 miles. Salmon River: World Renowned White Water Rafting and Kayaking! Salmon River Mountains to the west. This famous canyon is where some extremely popular white water rafting and white water kayaking is located. There are several fun pullouts and turnouts that allow travelers to watch the rafters and kayakers ride the white water of the Salmon River, and if you're interested in participating, there are several excellent rafting and kayaking guide companies located in the area, as well as in Stanley Idaho to the south. 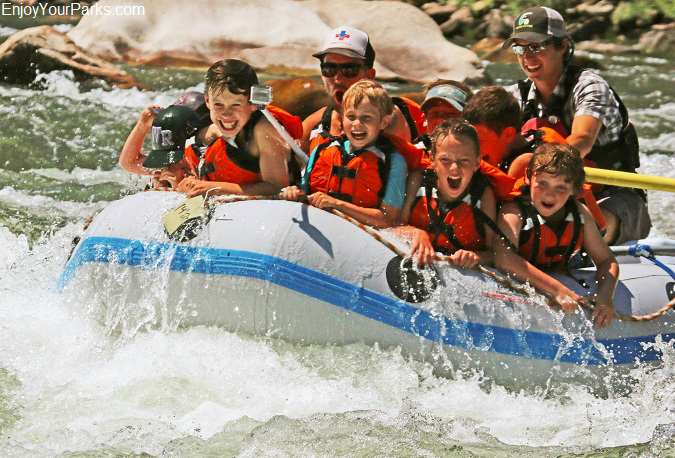 All summer long you will see many rafts and kayaks heading down the fabled white water of the Salmon River, and many of you will more than likely want to join in the fun. 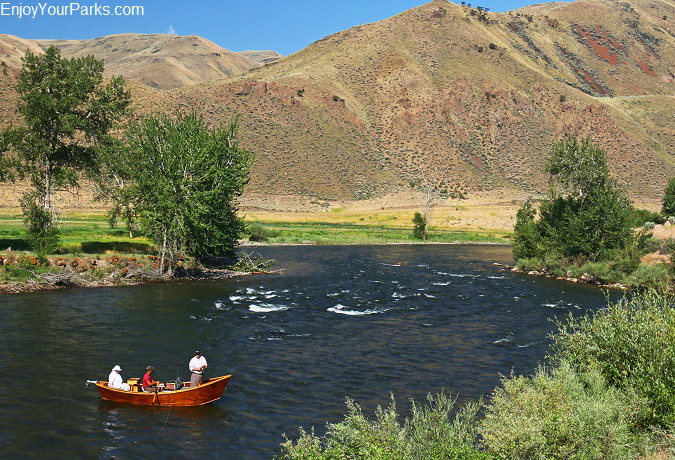 This section of the Salmon River between Challis and Stanley provides Class II to Class IV rapids, and is truly an enjoyable experience that we highly recommend. 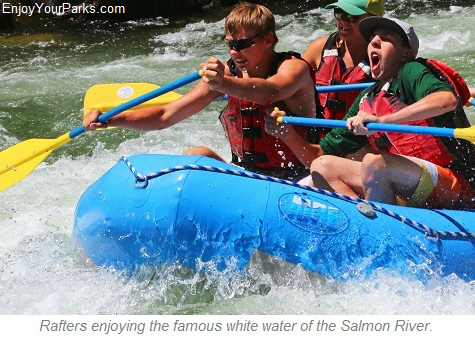 White water rafting on the Salmon River is world-renowned. Rafters enjoying the Salmon River white water! 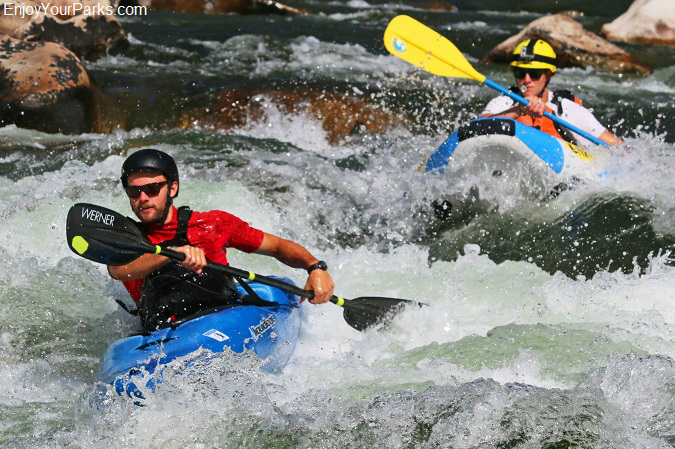 Kayakers navigating the world-renowned white water of the Salmon River in Idaho. 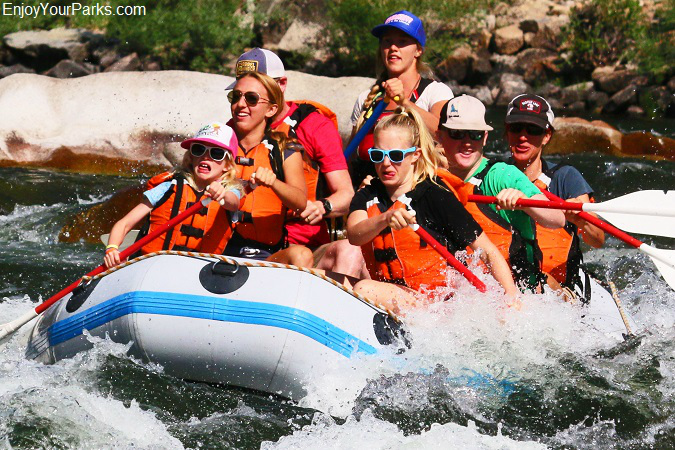 White water rafting on the Salmon River is an adventurous experience! 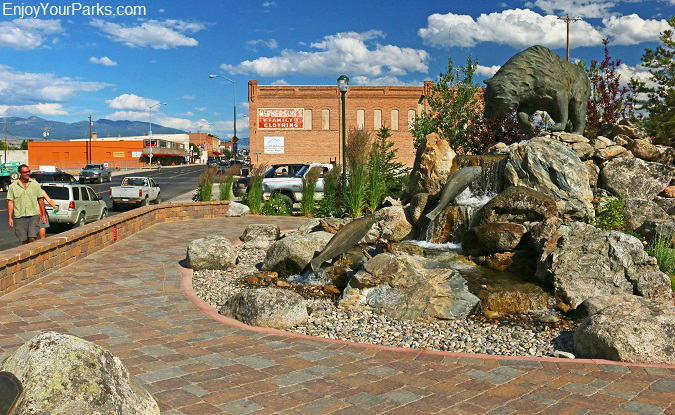 Stanley Idaho: Gateway To Adventure! of both the Salmon River and the South Fork of the Payette River, as well as being the "jumping off point"
for the 100 mile long wilderness canyon on the world famous Middle Fork of the Salmon River through the Frank Church-River of No Return Wilderness, Stanley is where thousands of whitewater rafters and kayakers come to begin their river adventures. Stanley is a small, charming tourist town that provides all the amenities that small tourist towns are known to offer, such as lodging, dining, shopping and river guides. There is also a wonderful museum located in Stanley that is a great place to learn about the amazing history of this area. 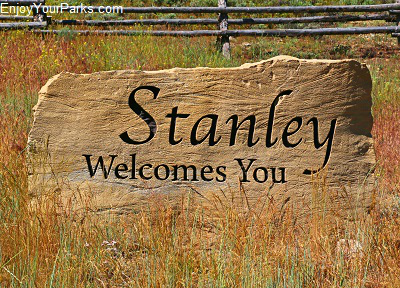 But the location of Stanley is what makes this charming town so incredibly remarkable, making it one of the most popular gateways to outdoor adventures in the entire West. 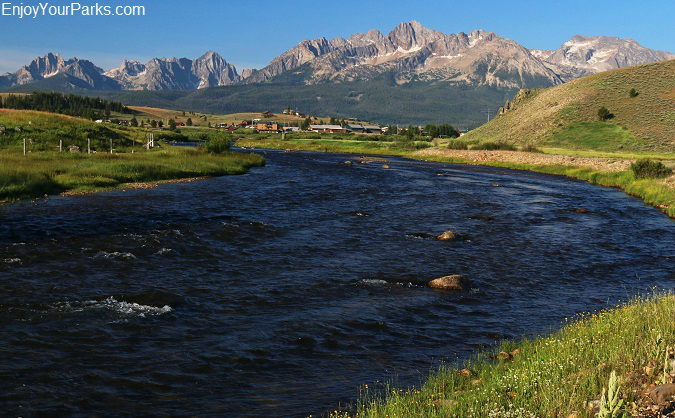 Salmon River at Stanley Idaho, with the Sawtooth Mountain Range dominating the skyline. 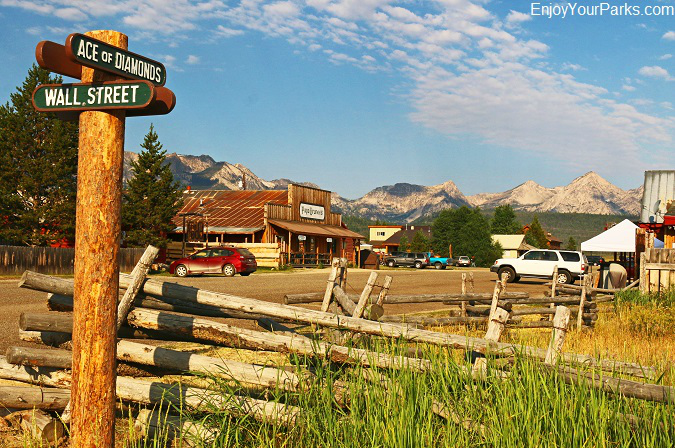 In addition to all this, Stanley Idaho is also known as "The Gateway To The Sawtooth Wilderness", as this charming little town rests just north of this tremendous wilderness area that beckons everyone who enters its city limits. The Sawtooth Mountain Range towers over Stanley to the southwest, and creates a stunning backdrop to this already gorgeous area. Stanley Idaho is the gateway to fantastic Idaho outdoor adventures! River of No Return Wilderness, which is the largest contiguous wilderness area in the lower 48 states at 2.3 million acres in size. 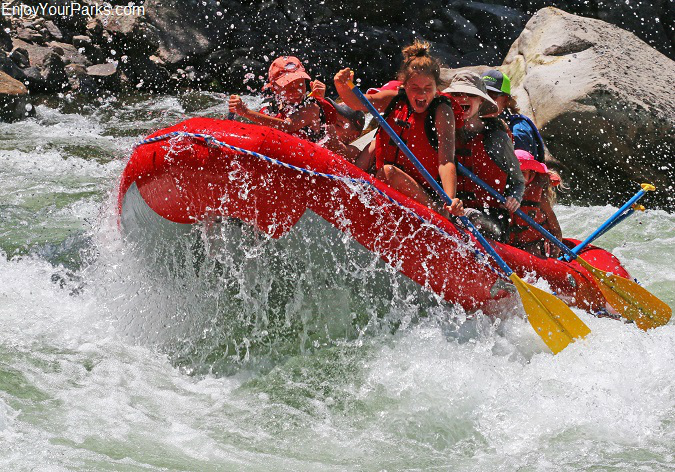 The Middle Fork of the Salmon River cuts through a 100 mile long wilderness canyon, which calls for a 6 day river adventure through some of the most wild country in America. The Sawtooth Mountains rise into the sky just southwest of Stanley Idaho, and are among the most scenic mountains in the Rocky Mountains. There are 57 peaks over 10,000 feet above sea level, with Thompson Peak being the highest at 10,751 feet. There are another 77 peaks that have an elevation between 9,000 and 10,000 feet, so needless to say the Sawtooth Mountain Range is home to an absolutely incredible number of major peaks. Much of this mighty range is part of the Sawtooth Wilderness, and also the Sawtooth National Recreation Area. 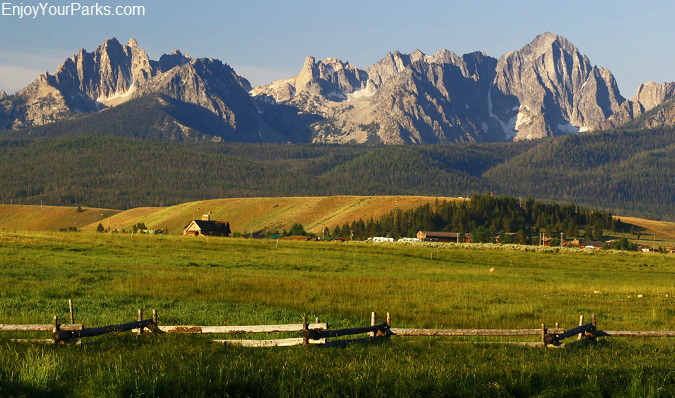 The Sawtooth Mountain Range dominates the skyline of Stanley Idaho to the southwest. Stanley Idaho marks the beginning of the Sawtooth Scenic Byway to the south along Idaho State Highway 73 that runs through Sun Valley Idaho and ends just north of Twin Falls Idaho, and the Ponderosa Pine Scenic Byway to the west which is along Idaho State Highway 21 that ends near Boise, Idaho. Copyright © 2008-2019 EnjoyYourParks.com. All rights reserved. All photos and text are protected by copyright laws, as well as the design and "look and feel" of this website. Any reproduction is strictly prohibited under penalty of law. WARNING: All outdoor activities can be dangerous, and you alone shall assume responsibility for your actions and safety. The information on this website cannot and shall not replace sound judgment and good decision-making skills. The scope of this website does not allow for disclosure of all potential hazards and risks involved in outdoor activities. Furthermore, the information found on this website are merely suggestions to help you plan your vacation. The authors are not liable and are not in any way responsible for the outcome of your vacation. Each individual must assume full responsibility for his/her decisions regarding his/her vacation, and shall not hold the authors responsible for any and all outcomes.